Bringing you another guest post here. This one is from James over at "I Should Do Some Homework." If you like wasting away your time here with silly stuff, you'll love his site, too. In 1997, in the heart of the England, Philip Shaw came home from a hard days work to find a humongous pile of ironing waiting for him. Not wanting to stay in to perform this intolerable chore and miss out on his planned evening rock climbing with friends he decided (in a moment of sheer genius/madness) to combine these two very different activities. 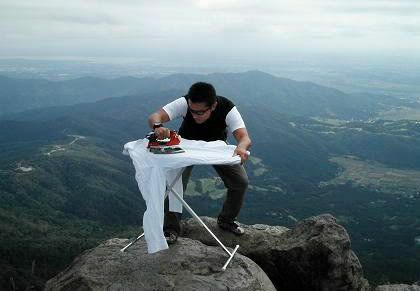 Extreme Ironing was born! Extreme Ironing according to extremeironing.com 'is the latest danger sport that combines the thrills of an extreme outdoor activity with the satisfaction of a well-pressed shirt". It sees sportsmen and women taking their trusty iron and ironing board all over the world to press their favourite shirt whilst doing something a little out of the ordinary. I'm not sure if the shirts are in a wearable condition after, but who cares?! It's a mountain of fun!